Another Beautiful Day in Paradise. We had clear blue skies, temperatures in the 80s and a breeze out of the West. 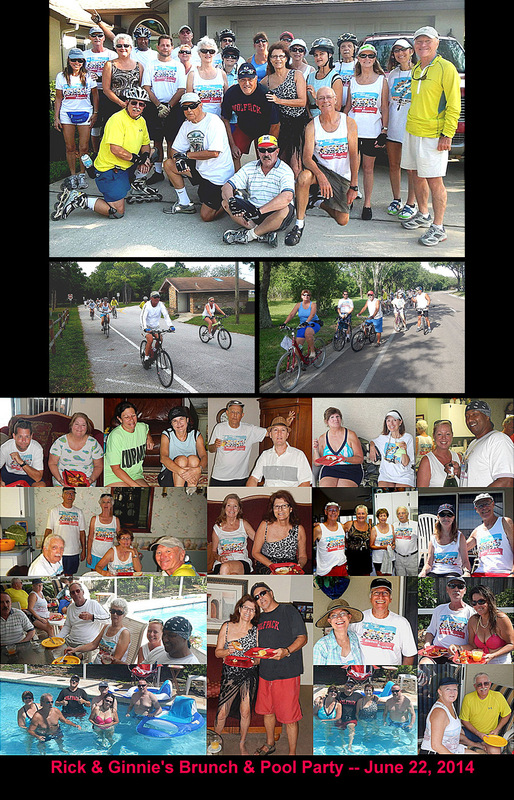 Bicyclers/Bladers Olivia M, Pete K, Janice H, Rick the Breeze, Dimitri F, Laura P, Roy H, Carol J, Dan & Linda C, Barb M, Norm, Nancy L, Paula C, Bob L, Dorey Anne, Joanie C & John L, Dee T, Steve G, Rick P & Ginnie S, Rob H and Bruce M came. Welcome all. We did our planned route sort of. About half way through the planned route, we had a bicycler fall and get skinned up and decided he better not bicycle the rest of the way back. Barb our leader, called Rick and ask him to come pick up our wounded bicycler. Barb took about two thirds of the group back on the planned route. The rest waited a while and then took the way back we came. Therefore the group that did the planned route did 10.5 miles and the rest did less. We had 21 bicyclers and 2 bladers. Rick and Ginnie had to stay home and finish preparing our Brunch. Karen T and Patrice H came late and missed bicycling. Deb came late and missed the group picture but came bicycling. Thanks Barb for leading the group. Paula C and Michael E renewed their Sponsorships. Thanks Paula and Michael for the website support. Rick and Ginnie had a grand and delicious Brunch waiting for us. We all stuffed our selves, laid back and socialized with everyone. Several jumped into Ginnie's beautiful pool and enjoyed getting cooled off. Many sat around the pool and watched the pool people having fun. Thanks Rick & Ginnie for a great Brunch and Social time had by all.